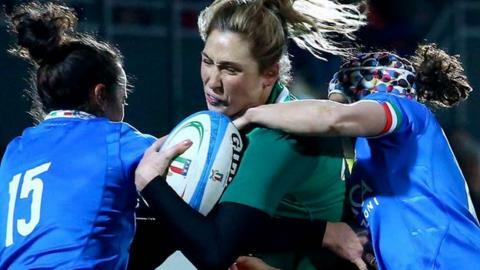 Ireland suffered their second 2019 Six Nations defeat as they lost 29-27 to a hard-working Italy side in Parma. It was a first-ever victory over an Irish team for the Italians, with a converted Giada Franco try in the 50th minute proving decisive. Both teams scored four tries, with six coming in a pulsating first half which ended with the sides level at 22 all. Wing Eimear Considine crossed the line twice for the visitors, with Anna Caplice and Laura Sheehan also scoring. Adam Griggs' Ireland picked up both bonus points as they now look ahead to welcoming France to Dublin in a fortnight's time, having followed up an opening day loss to England by beating Scotland. Italy remain unbeaten in this year's competition, having beaten Scotland in their opener and drawn 3-3 against Wales. It was a deserved victory for Andrea Di Giandomenico's Italian side, who made a fantastic start as an Aura Muzzo try helped them into an early 10-0 lead. Considine hit back for Ireland when she got on the end of a kick from fly-half Nicole Fowley to charge over and half the deficit. The home side stretched their lead again when Franco got the first of her two tries, converted by Michela Sillar, before Considine made a clever interception to double her try count. Fowley added the conversion and slotted home a penalty to reduce the gap to two points, with Ireland taking the lead for the first time when Caplice finished a sweeping move and Fowley was again on hand for the extras to make it 22-17 to the visitors. It looked like they would take the lead into the break but Sofia Stefan took advantage of a Ciara Griffin error to cross the line on the stroke of half time. Franco's all-important second try came in the 50th minute but, while substitute Sheehan crossed again for Ireland, Fowley was unable to add the conversion. The second half was unable to match the pace and drama of the first, and Italy held on for an historic victory. Italy: Furlan; Muzzo, Sillari, Rigoni, Stefan; Madia, Barattin; Giacomoli, Bettoni, Gai; Fedrighi, Duca; Arrighetti, Franco, Giordano. Ireland: Delany; Considine, Naoupu, Claffey, Miller; Fowley, Dane; Feely, Hooban, Lyons, A McDermott, Fryday, Caplice, Molloy, Griffin (capt). Replacements: A Bhaird, Peat, Reidy, Boles, Sheehan, McLaughlin, Hughes, Murphy, Sheehan.